Dr Dhiraj Gupta is a consultant cardiologist/ electrophysiologist at the Liverpool Heart and Chest Hospital (LHCH) since 2007. LHCH provides tertiary level cardiology service to a population of 2.8 million in the North West of England, and North Wales, and is the largest cardiac centre in the United Kingdom. Dr Gupta is a very high volume operator in interventional EP, and has performed over 200 AF ablation cases annually since 2009. He is the trust lead for Left Atrial Appendage Occluder (LAAO) Service, and LHCH is one of 10 sites selected nationally by the NHS England as part of the Commissioning through Evaluation (CtE) program. 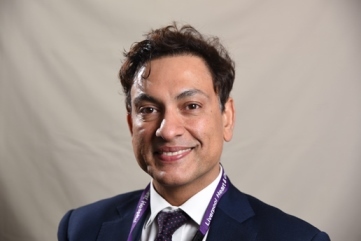 Dr Gupta proctors cardiologists nationally and internationally for LAAO implants, and has been awarded NHS Clinical Excellence Awards in 2010, 2014 and 2015. Dr Gupta has earned repute for his expertise in treating patients suffering from Atrial Fibrillation (AF), and works with the British Heart Foundation to provide education and training to their staff nationally. He is also member of the Medical Advisory Committee of the national charity, AF Association. He has been elected to the Council of British Heart Rhythm Society in Oct 2015 for a term of three years, and helps shape national guidelines and policies related to arrhythmia care. Dr Gupta has held the position of Honorary Senior Lecturer at Imperial College London since 2011. He is the primary supervisor for several research students at Imperial College, and also assesses the progress of other Imperial Students working towards higher research degrees. He is the Chief Investigator for multi-centre trials like PRESSURE, SMANPAF, and PRAISE, and have been successful in obtaining over ?1.5 million in competitive research grants.